Doesn't seeing a flamingo on something just immediately make you feel happy? As summer approaches us, I am seeing them grace more items in the stores. 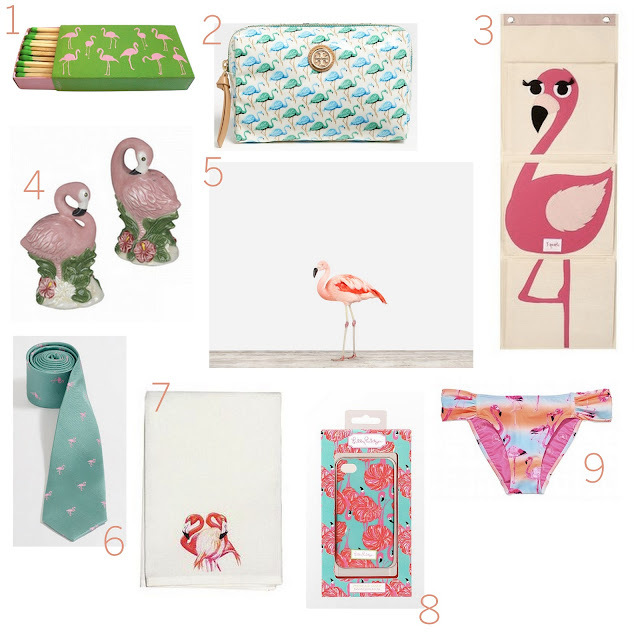 Above are some fun picks in case you need some flamingo in your life! 1 | Would be really cute next to a candle on the patio this summer! 3 | How fun would it be to get your organize on with this funky organizer? 5 | The classiest of all things flamingo. A gorgeous print for your wall. 6 | A preppy tie for a summer wedding. 7 | The bathroom just got a little bit brighter & your hands a little bit happier. 8 | You can't go wrong with anything flamingo by Lilly P.
I absolutely love flamingos! I'm definitely hoping to add the flamingo bathing suit to my collection, and I want absolutely everything in the flamingo Lilly print! So so so cute. Of course tory does it cutest! I have loved their bags for a long time. I need to now just pony up and buy one!